This picture is cool example how you can transform ordinary clothing from mass market into original and unique work piece. Here you see child’s knitted t-shirt. It was decorated by portrait of lion from cartoon about Madagascar on its chest firstly. Then author added this print by thematic picture on right side. 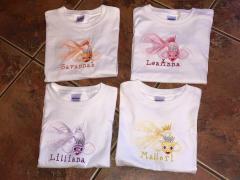 Pictures are Lion Alex embroidery design and Lemur machine embroidery design. This is good sample for people with great taste in music. You already recognize name of band which is true symbol of quality music for all times. Metallica music band logo machine embroidery design can be small but impressive detail which let you be known by your colleagues who like it too as much as you. Name is executed by well known font. T-shirts can be found practically in anyone’s wardrobe. They are soft, unpretentious and comfortable to wear. That is to say, unpretentious if you want them this way. 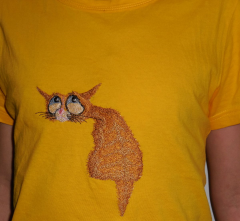 A pretty embroidery design will make the simplest everyday item distinctive. At the same time, this simplest everyday item may prove a real challenge for an embroiderer. 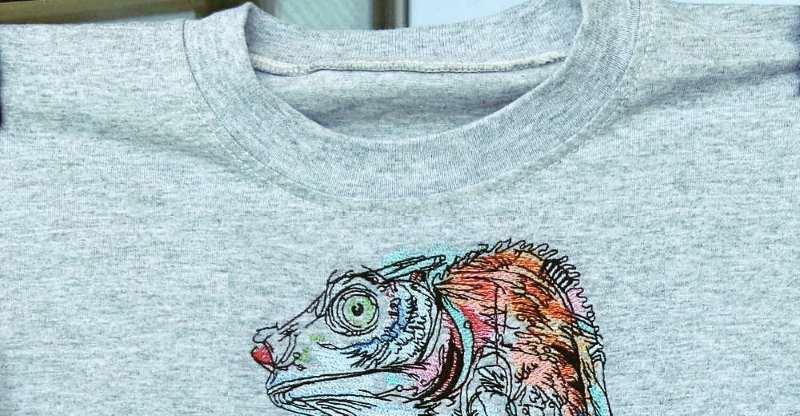 While this article was originally intended for beginners, it turned out that many seasoned embroiderers are afraid to tackle with T-shirts as well. And why? Because knits can be really tricky. Here are some tips that will help you tame them. Buy a good T-shirt T-shirts are predominantly made of cotton, but other kinds of fibers may be used as well—rayon, polyester, Lycra, linen, and various blends. They have slightly different properties, and there are also quality grades. Combed cotton is softer than basic cotton, and Pima cotton, thanks to its extra-long fibers, is considered the finest of all. Not only T-shirts of finer quality wear better but they also pucker less. They also differ in weight. Heavier fabrics are preferable for fibers in them don’t warp as much as in the lighter ones. 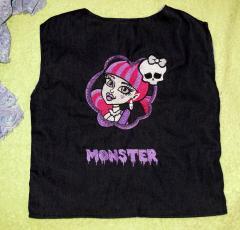 Pre-launder Wash your T-shirt before starting an embroidery project. Cotton shrinks after laundry and your design might get badly distorted. Choose a good backing T-shirts are washed on a regular basis, therefore, the stab should be stiff enough to keep the embroidery in shape while not making a garment too uncomfortable to wear. Cutaway stabilizer is preferable because it doesn’t deteriorate as quickly as the tearaway one in the course of time. The fusible mesh is, probably, the best option. To hoop a T-shirt, cut a piece of stab larger than your hoop, sprinkle it with a temporary spray adhesive or use a glue stick, press your T-shirt to it and hoop the whole thing. Don’t forget that a stretchy fabric should never be drum-tight in the hoop! 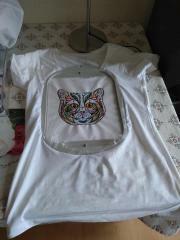 If you are afraid of the hoop burn, try to hoop the stab and glue your T-shirt to it. 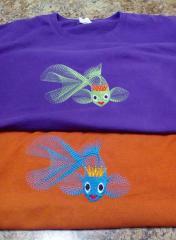 If you don’t have any special devices, the embroidery will require some acrobatics but it is possible. After you’ve finished the embroidery, remove the excess stabilizer by cutting it close to the stitching. If you have sensitive skin, covering the back side with fusible tricot interfacing might help. Use a topper Additional stabilization will make the embroidery look neat. Cover the embroidery with a piece of thin water-soluble film and baste it. The extra film will come off easily when rinsed with water. Always do a test-stitch Unless you’ve embroidered this design before, on the same equipment and with identical consumables, it’s won’t hurt to try it first. The fabric should be similar to the one you’re going to use for your project. A tip: keep your old T-shirts, they will make a fine testing range. Select a lighter design Heavy designs with a large stitch count often look and feel like a patch. Thin and delicate knitted fabric cannot support the dense stitching at the edges; there will be wrinkles no amount of ironing will remove. Lighter designs with open structure are better for T-shirts. Use the right needles and threads You’ll need a ballpoint needle that doesn’t cut through the fibers but gently pushes them to the sides. The smaller the tip, the better. Use 70/10 needle for lightweight fabrics, and 80/12 for heavier ones. For T-shirts, one should select a durable thread that will be able to withstand repeated washings without losing its strength, color or luster. Polyester threads meets all these requirements and is, therefore, the best choice. Tack before the embroidery Basting the whole thing prior to the embroidery will provide yet more stabilization. It keeps the water-soluble topping in place and also prevents the lower stabilizer from shifting. Press the embroidery from the back Having finished the embroidery, turn the T-shirt out and press it from the back side with an iron. Apply pressure gently, don’t make the iron too hot and use a pressing cloth. 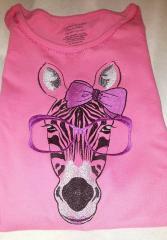 Do zebras wear pink glasses? It turnes out they do. See how good she looks! 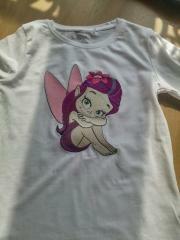 This pretty child’s t-shirt shows you good example of clothing’s decoration. 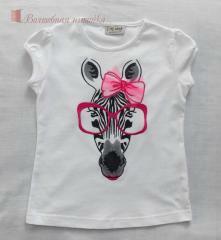 Its front part is embellished by original portrait of African zebra in big glasses executed in big size. So it is really impossible not to note it! This clothing’s owner will be in center of attention. 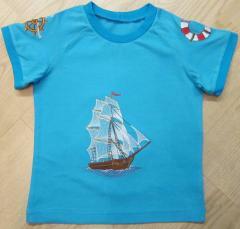 This picture shows interesting perspective of embroidered t-shirt designed for boy. 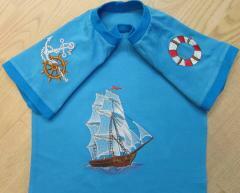 This angle is used to demonstrate all embroidery sample used for this clothing’s decoration. You see here some pictures of marine theme such as lifeline, steering wheel and anchor. 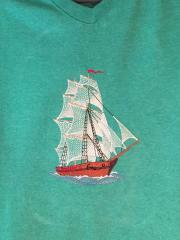 But center of all composition is definitely Sea ship free embroidery design. All of them looks very organic on background fabric which looks exactly like sea. 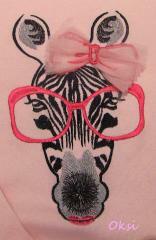 A clother look at an outfit decorated with a zebra in pink glasses and decorated with a pink bow. This zebra is a cocquette! 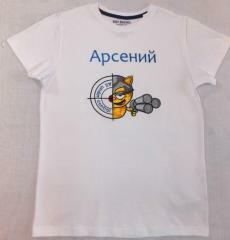 This is cool embroidered t-shirt prepared for teenager boy. HE will be definitely pleased by this original and interesting work piece. 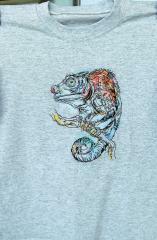 It is decorated with Squirrel All Under Control - Manimals machine embroidery design. This funny sample will attract much attention to him. Furthermore it is added by his name executed by identical font. In short it is stylish clothing.